Qualeduc is meant to be a tool for schools and inspection bodies in order to develop a quality insurance approach based on continuous improvement. The Qualeduc Mobilities project aims at strengthening the professional development of participants in the field of quality, by providing a European perspective on this very matter. Use of this approach is encouraged by the Recommendation of the European Parliament and Council of 18 June 2009, which establishes "a European quality assurance reference framework for education and vocational training", intended to help Member States promote and verify the continuous improvement of their education and vocational training systems, based on common European reference standards. The Riga conclusions, adopted on 22 June 2015, encourage the development of quality assurance mechanisms in the field of education and vocational training, as recommended by the EQAVET (European Quality Assurance in Vocational Education and Training), and the production of continuous feedback based on learning outcomes. Quality assurance methodology is based on continuous improvement, as expressed by the Deming wheel or PDCA: plan do check act. 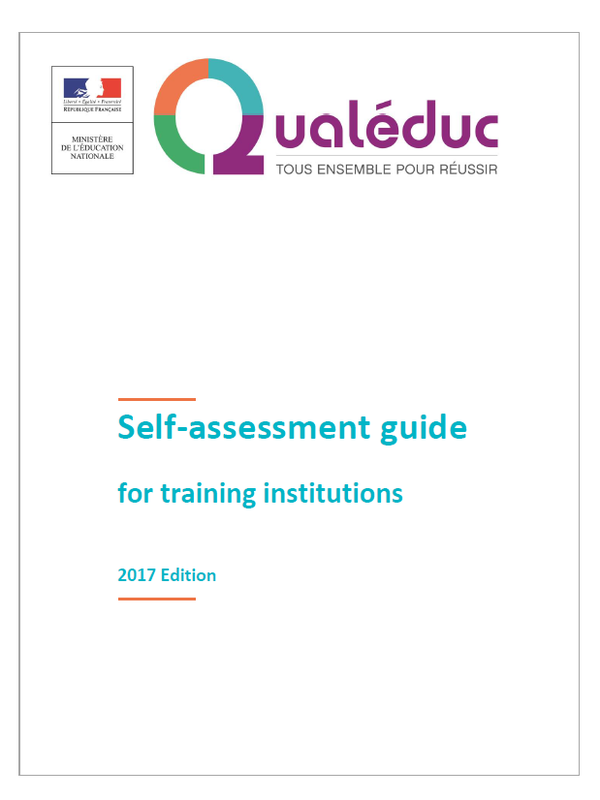 Resulting from the European Qalep project, initiated and supported by the French ministry of education and research, Qualéduc is an evolutionary and adjustable tool for self-assessment. The Qualéduc project is steered both at a national and a regional level. The national steering committee defines targets.Its members are also in charge of supporting regional Education Authorities in the implementation process. The regional steering committees are chosen by the chief executive of the regional Education Authority (Académie). They provide training, support and advice to teams interested in using this quality tool. developing and recognising the professionalism and commitment of staff. 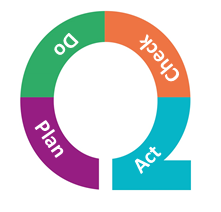 This guide can be used to initiate analysis and discussion by teams that wish to put in place a self-assessment and continuous improvement approach to quality. It is designed for school heads and the whole of the educational community. draw up or alter a plan, presenting the targets and areas of progress, actions for improvement and an implementation plan, providing monitoring tools such as performance indicators, monitoring files, etc. The school sets out the topics it wants to work on, depending on the national priorities, academic demands, the context, its strategy, ensuring they are integrated into a systemic vision. Each self-assessment file must be considered as a tool, not a reference standard, as it offers an analysis process. It is introduced by a legislative and regulatory reference, outlining the national framework covering the school's activities. The questions are not exhaustive and can be used to analyse the whole of a topic, identify the key points and cover the stages of the wheel. At the regional level, the analysis of the implementation of the Qualeduc tool has shown that it was necessary to support the development of a shared "culture of quality" among academic teams as well as to define a common strategy in order to improve the success and the vocational integration of students by comparing the French practices to other practices implemented in EU countries on the long term. Regional Education Authorities of Amiens, Caen, Clermont-Ferrand, Dijon, Lille, Lyon, Nantes, Orléans-Tours, Rennes, Rouen, Strasbourg, Toulouse, Versailles. The project addresses to school managerial staffs, inspectors general of education, educational advisers, academic staff in charge of quality and teachers. This project was launched in September 2017 and will take place over two years. It will operate in four phases, two of them consisting in 105 mobilities of staff involved in VET in 5 partner countries having strong experience in the process of continuous improvement of quality: Austria, Germany, Italy, Scotland and Sweden. The two other phases will be implemented with the support of the Higher School of National Education, Higher Education and Research (ESENESR): It will consist in seminars contributing to elaborate a first diagnosis on the various approaches in the fields of continuous improvement of quality and governance ; debrief the fields observations and hence to set up the working framework based on the results of the first diagnosis; disseminate and communicate on the results observed as well as on the translation of good practices into national policies. Five academies are in charge of the organization of the mobilities, which shall allow observing, sharing and analyzing good practices aiming their translation into national policies. Field visits and observations will be organized and led by small groups during 5 days. They will focus on governance issues such as management, continuous improvement of quality, assessment modalities and on the pedagogical methods implemented in schools. Regarding the steering elements bringing an added value to be observed, the participants will focus on the objectives, the organizations, the assessment tools, the actors, communication tools, indicators and defined processes.